Home Food Triangle Drive In: Good Times. Better Burgers. Triangle Drive In: Good Times. Better Burgers. 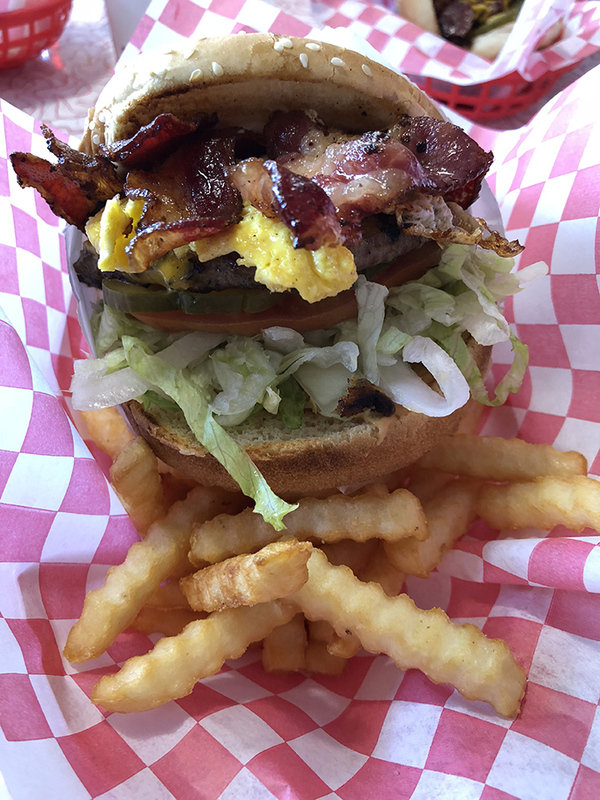 For our recent lunch review, we decided to take a trip back to the 50s and grab a burger at the new Triangle Drive In location in Clovis. We weren’t sure what to expect initially. However, we quickly found out what the retro-style diner is all about. Some members of our group played it safe and ordered regular cheeseburgers while others tried unique options like the pastrami sandwich and jumbo bacon cheeseburger with fried egg. Each burger was freshly made, as evidenced by the sizzling sound and smoke coming from the grill in the back. These weren’t your normal burgers as each one was carefully layered with a fresh beef patty, cheese, lettuce, tomato, pickles and your choice of sauces. To complete the meal, we went with french fries and onion rings on the side. The crinkle-cut fries were delicious while the onion rings tasted like they had been made from scratch. Speaking of fresh – the burger joint also offers fresh brewed tea and lemonade in addition to its selection of fountain drinks. Of course, milkshakes and floats are also available. While Triangle Drive In is known for serving great burgers, it’s also known for its 50s-style interior complete with diner-style tables and booths, arcade machines, vintage signs of top brands, and framed photos of icons like Elvis Presley and Marilyn Monroe. Over 50 years after opening its first restaurant in Fresno, Triangle Drive In continues to serve great food and in the same kind of atmosphere. Hours: Open every day of the week, 10 a.m. to 9 p.m.